Image courtesy Google Street View. Though it has sat vacant for the last dozen or so years following a blockbuster $10 million sale, the former Ford factory on Pittsburgh’s Baum Boulevard, an anchor for that city’s automobile row, appears poised for revitalization after it was added to the National Register of Historic Places last month. Of course, the $25 million that the University of Pittsburgh committed to buy what it’s calling 5000 Baum from the University of Pittsburgh Medical Center this past summer eclipsed UPMC’s $10 million purchase of the building in 2006, but it was the latter exchange that, according to the Pittsburgh Post-Gazette, dropped jaws in the area. One developer told the Post-Gazette in 2012 that the sale was far over market value, and then-Pittsburgh Councilman (now mayor) Bill Peduto said that sale alone brought the real estate market in that area to a halt as others nearby recalculated how much more money they could get for their property. Not bad for a place that, though still in use, had largely been vacated and abandoned in prior decades and still, at nearly a century old, had many of its original fixtures, from its rusted-shut steel-frame windows to the 90-foot-high open crane bay used for shuttling supplies from the adjacent rail siding to each of the building’s eight floors. In 1915, Ford Motor Company had the 180,000-square-foot factory built as part of its plan to distribute automobile production across the country and around the world. 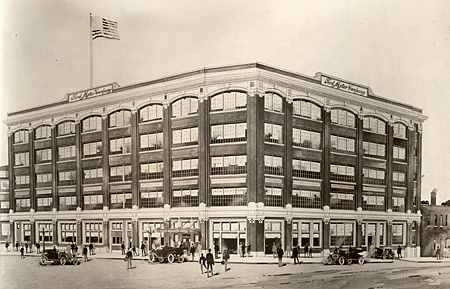 As with the Indianapolis Ford factory and as many as 30 other Ford factories, Seattle architect John Graham penned the design of the Pittsburgh factory, which Ford Motor Company placed at the corner of Baum and Morewood Avenue in the city’s Shadyside neighborhood. As designed, the factory workers would take individual components off the rail cars and shuttle the components directly to the appropriate floor. As cars progressed from the upper story downward, workers gradually installed more parts until, upon arriving in the first-floor showroom, the cars were ready to sell (in addition to the five above-ground stories, the building also featured a basement and two sub-basements). In addition to customers in Pittsburgh itself, the factory assembled Ford cars, Ford trucks, Lincoln cars, and Ford tractors for more than 2,700 dealerships in the Pittsburgh service area. Photo via National Park Service. According to the National Register of Historic Places nomination form for the building, production continued there through 1932 (the Pittsburgh Press reported in 1936 that the plant would soon re-open, though that apparently never happened). Ford, after perfecting the assembly line method of production, had started to convert or back-burner its old factories as early as the 1920s. The Pittsburgh factory’s location made it difficult to remodel into a single-story assembly line-focused building, so it transitioned into a sales, parts, and service branch of the company and remained so until Ford Motor Company sold off the building in 1953. Afterward, the building became a motor supply warehouse and then, following a 1969 sale to Murray Reidbord, a clothing factory. Though Reidbord exited the clothing business sometime in the 1990s, he held on to the factory and leased it out as office space and a party supply store. 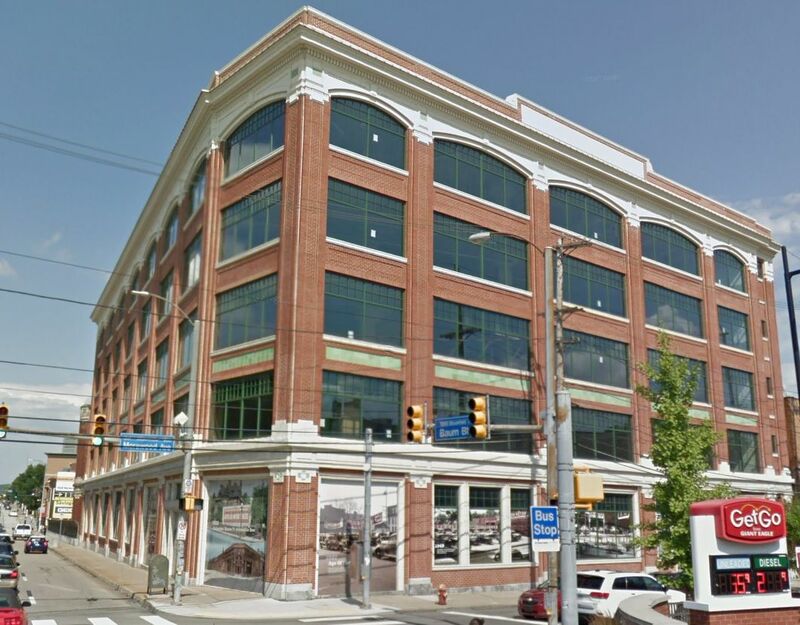 According to Reidbord’s daughter, he didn’t exactly want to sell the building when UPMC came knocking – he had paid less than $500,000 for it originally, and his tenants made it worth keeping the building – so he told UPMC the $10 million asking price, hoping the hospital system would just buzz off. Instead, its directors ponied up the cash that spring. Reidbord died just six months later. With plans to turn it into a research laboratory, UPMC contracted with Celli-Flynn Brennan architects to undertake a years-long restoration effort on the building that included replacing the old windows, opening up previously blocked-over windows, tuck-pointing the brickwork, and replacing aged or destroyed cornices and other exterior decorations. Then, this past July, the University of Pittsburgh announced that it would both buy the building from UPMC and partner with the hospital system on the building’s three-phase transformation into a center for immunology and transplant research, overseen by Wexford Science & Technology. The first phase alone is expected to cost $250 million. The National Park Service added the building to the National Register of Historical Places on November 23. According to the university, the newly renovated building, expanded to 215,000 square feet, will open in 2020.